Metro Police Chief Steve Anderson (left) listens to Mayor Megan Barry’s remarks at the groundbreaking ceremony for the new police headquarters and Family Justice Center. Behind Chief Anderson is a rendering of the new building that is projected to be completed by Spring of 2018. NASHVILLE, TN — Mayor Megan Barry was joined by Chief Steve Anderson, other Metro officials and community leaders to break ground and celebrate the start of construction on the new Metro Nashville Police Administrative Headquarters and Family Justice Center at the site of a former car dealership at 600 Murfreesboro Pike. 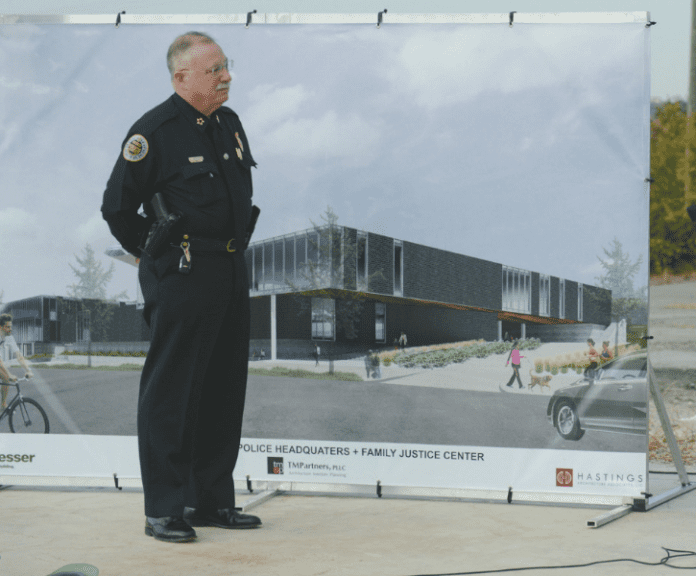 The 61,000-square-foot, three-story, administrative headquarters will serve as the face for the Metro Police Department, designed to be a welcoming place that connects the neighborhood and is a hub of public service. In addition to housing administrative and certain investigative functions of the department, there will also be a data center in the new facility. The Family Justice Center, which will be 44,000 square feet and two stories tall, has been designed to serve as a resource for those in need. 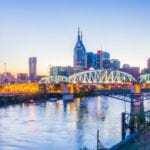 Located within the FJC will be Metro’s Office of Family Safety, police Domestic Violence Division counselors, Nashville Children’s Alliance, and components of the District Attorney’s Office and Tennessee Department of Children Services. In 2015, for- mer Mayor Karl Dean held a groundbreaking ceremony for the site following the passage of his Capital Spending Plan, which included $20 million for the project. Rendering of the new police headquarters and Family Jusatice Center to be located at 600 Murfreesboro Pike in Nashville. Center, Mayor Megan Barry and Metro Police Chief Steven Anderson attend the ceremonial ground breaking event.